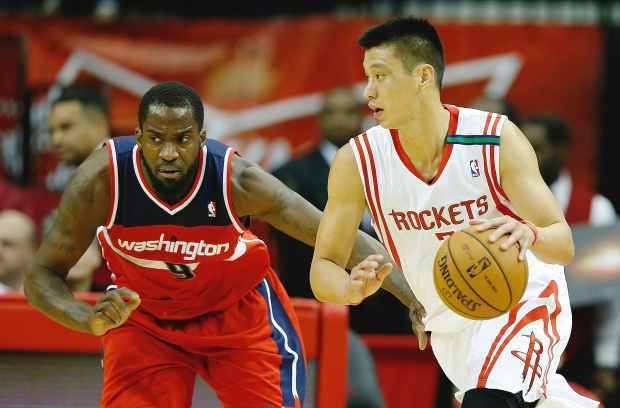 Jeremy Lin of the Houston Rockets (right) drives against Martell Webster of the Washington Wizards at the Toyota Center in Wednesday’s National Basketball Association action in Houston. CHARLOTTE, N.C. – New Hornets guard Jeremy Lin says he had trouble convincing a security guard that he’s an NBA player when he showed up at the team’s Charlotte arena. A Hornets spokesman said the team didn’t have any comment. The 6-foot-3 Lin signed with the Hornets in July. His playing time and production decreased during stints with the Lakers and Rockets.